The first step in assuring you receive meaningful process gas analysis is to find great process gas equipment that is relevant and reliable for the process task at hand. In our newest product guide, Nova Analytical highlights our unique approach to offering turnkey continuous process gas solutions using superior technology housed in robust equipment. The DuraNOVA line of products utilizes smart sensors, controls and modules to offer all combinations of gases and ranges available to meet every specification. 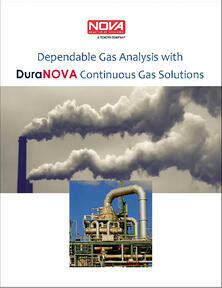 Download our product guide, Dependable Gas Analysis with DuraNOVA Continuous Gas Solutions by filling out the form to the right.